SHSU graduates Ron Blatchley and Trisha Pollard are serving as chair and vice chair, respectively, of The Texas State University System Board of Regents this year. With the election this week of Sam Houston State University alumnus Ron Blatchley of Bryan as chair of The Texas State University System Board of Regents, two SHSU graduates now hold the No. 1 and No. 2 positions with the university’s governing body. 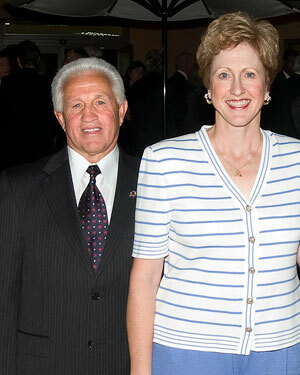 Blatchley joins Trisha Pollard of Bellaire, who was elected vice chair of the regents in November 2008, after serving a previous term as vice chair. “Sam Houston State is fortunate that both the chair and vice chair of the board of regents of The Texas State University System are Bearkats,” said SHSU President Jim Gaertner. “I have known Ron since we were neighbors at the old Gintz married student housing in the 1960s,” Gaertner said. “Ron brings a wealth of experience in both business and campus life to the position. He will be an outstanding chair. “Trisha Pollard is a tremendously talented and dedicated member of our board, and along with Ron, she will represent SHSU and all system schools in an outstanding manner,” Gaertner said. Blatchley received bachelor’s and master’s degrees in education in 1968 and 1969 from Sam Houston State University. He was appointed to the board of regents by Gov. Rick Perry in 2007. Blatchley is president of R. Blatchley Management and serves on the board of directors of First National Bank of Bryan/College Station. He has previously chaired the Bryan/College Station Economic Development Corporation, as well as served on the boards of the Chamber of Commerce, McDonald's Operators Advisory Board, The Ronald McDonald House of Houston, the Texas Municipal Power Authority, and numerous other civic and charitable boards. Blatchley served four years in the U.S. Air Force and was the director of student affairs at Texas A&M University for 14 years. He also served as a city councilman and mayor of the City of Bryan. In addition, he has been the recipient of such awards as the 2001 Newman Award for an outstanding businessman in Bryan/College Station, 1998 Outstanding McDonald's Partner for the top 20 franchise owners in the world, and “Top Rookie Owner/Operator” in McDonald's of Texas, among many others. Blatchley and his wife, Ruth, helped provide one of Sam Houston State University’s most noticeable landmarks, the Bell Tower. The Blatchleys also provided a clock in the Alumni Garden, located near the Lowman Student Center on campus. In 2006, the Blatchleys were both named Distinguished Alumni of Sam Houston State University. Pollard, a 1974 business graduate of Sam Houston State University, is vice president of Pollard Development, L.P. and lives in Bellaire. Her husband, Randy, is also a Sam Houston State graduate and a Huntsville native. Pollard received her Juris Doctorate from South Texas College of Law in Houston. She was appointed to a six-year term on The Texas State University System Board of Regents by Gov. Perry in 2007. She was first elected as vice chair in November 2007 and again in November 2008. Pollard has served as a board member of the SHSU Alumni Association, as foreman of the Harris County Grand Jury for three terms, and as chairman of the Building and Standards Commission for the City of Bellaire. She also serves on Houston Bar Association committees, was chair of the Oil and Gas Section of the association, and is a member of the State Bar of Texas. The Texas State University System is the oldest multi-campus system in Texas and plays a critical role in the educational and economic development of the state. It is governed by a nine-member board of regents appointed by the governor. In addition, a non-voting student regent is appointed annually to the board. TSUS’s eight component institutions include: Lamar Institute of Technology; Lamar State College-Orange; Lamar State College-Port Arthur; Lamar University; Sam Houston State University; Sul Ross State University; Sul Ross State University Rio Grande College; and Texas State University-San Marcos.